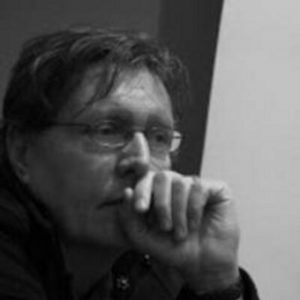 This interview with József Böröcz, professor of sociology at Rutgers University, was conducted by Ágnes Gagyi and Gergő Pulay in 2012. In a way, it is a dense summary of the conceptual perspective which had informed the new wave of intellectual left emerging in the region – including LeftEast – especially in regard to Eastern Europe’s post-socialist transformation and EU accession in the context of global capitalism. Four years later, further mired in the conflicts that this perspective foreshadowed, this concise summary is colored by the experiences, fatigue and different social geography of the left in the region. It invokes a feeling of intellectual vertigo, but also a clearer sense of orientation. You have a strong critique against the way Eastern European regime change has been framed as a transition process that aims towards „catching up” with the West. What is the problem with that? The language of “transition” fits snugly into that framework. The implication is that these societies are somehow pre-modern and that the post-socialist transformation is a series of steps whereby the most optimal state of society—that is, market capitalism and bourgeois liberalism—are acquired in Eastern Europe. That’s what the ideal type “transition” means. Each of those claims is empirically false, but that is not the biggest problem. The real problem is that the theory itself is deeply corrupt. In its initial form, it was basically a fully Eurocentric form of scholarship, created and used to legitimize “Western” colonial rule. It is fascinating to witness how the collapse of the “Communist Bloc” gave new life to a set of theories that had already been pretty much discarded by then—definitely in American macrosociology (which is the context in which I do most of my work). The most ironical thing to me is that even one of the greatest proponents of modernization theory, Samuel Eisenstadt, even he retreated from his earlier, strong, monocultural position on ‘modernization’ sometime around 1990, and proposed the idea of “the multiple cultural program of modernity”—i.e., admitting that “Western” cultural practices are not the only viable kinds of modern social forms. That conceptualization was a compromise forced by the obviously “modern,” global economic success of countries like Japan or South Korea. I just use that example to point out that, when international area studies, dealing with post-socialism and their post-socialist intellectual subcontractors, revived modernization theory, it was quite absurd. Most of my work in this regard has been devoted to devising an alternative, an updated version of dependency theory—something that was first developed beginning with the 1960’s for Latin America—and world-systems analysis, broadly speaking, not just the works of Immanuel Wallerstein, but also those of Giovanni Arrighi and their numerous students. I locate myself somewhere between the third generation of world-systemites and the intellectual field commonly referred to as Postcolonial Studies. From the perspective of dependency theory, it is quite clear that the story of the “transition” involved a radical rearrangement of the external dependencies of these societies. From the perspective of world-systems theory, the question is how this rearrangement is connected to large-scale global transformations. Clearly, the two have been very deeply connected, in two important ways. One is the story of neoliberal ideology, to which the post-state-socialist “transition” gave an enormous boost, almost as a final validation (before it all revealed itself as a spectacular failure). There is a global hegemonic process of neoliberalism, and our transformations have been fully located within that. The other connection is that the core of the global economy itself changes with the slow erosion of the role of the US and western Europe and the geopolitical event of those two “winning” the Cold War. Would you go back to explain what this project of transition meant from the perspective of dependency and property relations? I have published quite a few papers on this, and one might be quite relevant to that question, it is called Dual Dependency and Property Vacuum. It argues that, during the communist period, our societies were caught up in something that can be described as a dual system of external dependency. Partly they were dependent on the Moscow center—of course, with differences and variations across countries—but, by being members of the Warsaw Pact and the Comecon, they were linked to political center of the Soviet Union. All of these societies at the same time were also dealing with the West, hence the duality of the arrangement. In the case of Hungary, that duality was clearly linked to two waves of decisions within the Communist Party, both of them pointing in the direction of taking up foreign loans. The first one had to do with the oil crisis of the 1970s. There was a considerable excess of capital in the world economy, something that needed to be invested, so it was channeled and lent through major banks to the so-called communist governments of east-central Europe and the Soviet Union. The Hungarian case is one in which there was a central decision already from the late 1960s on to prioritize individual consumption to the detriment of collective consumption, and these incoming loans was used to a large extent to finance such consumption. In the early 1980s there was a second wave—it was clear that these societies were not able to pay the loans back in time, there being a series of structural crises, that led to a second wave of borrowing—at much worse rates than the first. So one leg of dual dependency was political dependence on the Soviet center. The other had to do with fiscal dependence on the centers of global capitalism through indebtedness to Western banks. The historical irony of the situation was that those two “prongs” of dependence knew about each other and, even more fascinating, mutually approved, and relied upon, each other. This yields an interesting and rather complex view on the Cold War as a geopolitical arrangement in which the two sides are supposedly at each other’s throat but, at the same time, there is plenty of implicit collaboration going on, including such things like the anecdotal stories of major Austrian banks putting together Hungarian and Polish debt through informal network ties to the leadership of the National Bank of Hungary. The key element here is that these governments used the loans to finance mainly what can be described from a critical sociological angle middle-class and upper-middle-class consumption. So the loans that whole societies were made responsible for were used to finance the top 5% to 10% of these societies. In the case of Hungary, it is very clear that most of the loans and the consumer goods purchased with them went geographically to Budapest and maybe one or two industrial centers, to the regime’s favorite “upper-middle” classes. That was the financial reality behind Kádár’s dream of buying social peace. However, that did not exactly buy social peace—instead, it increased social inequalities already in the socialist period. It is also clear that at the time of these two waves of loans, all socialist economies began to decline. Not necessarily in terms of per capita income, but definitely in terms of their global economic weight. That suggests that some kind of change has happened regarding their insertion into the global economy. The key element to that change, in my opinion, is that the political leadership in these societies gave up their earlier, “doctrinaire” position that they would not take up for-profit money from core capitalist countries. In other words, they abandoned their socialist principles, for whatever that’s worth. The post-state-socialist transformation meant that the first leg of dependency collapsed, and it did so with breathtaking suddenness. Now, with the hindsight of twenty-plus years, we can see that what followed was a wholesale liquidation of the assets of state-socialist society. Obviously, state socialist property was a highly imperfect system in the sense that the relationship between society and its assets was very restricted, and much of those restrictions were all about preventing society of actually using those assets. But what is fascinating is that, after 1989, these societies went, almost automatically, in the direction of having even less control over those assets. So, as global-scale transformation, we see about 300 million people somehow miraculously letting go of their collective assets without even lifting a finger. Whether that was a great idea or not—this conversation didn’t even happen. I mean, has anybody even asked who exactly gave the right to state-socialist governments to actually sell those assets to private investors? A wholesale liquidation of actually 100% of those assets happened, and there was actually no conversation about that. What was there was a technocratic discourse that trumpeted that private property is essentially superior to collective property because society is ontologically unable to control its assets. The argument went, “it is unthinkable that under any social system a society could actually control its own assets in such a way that it is used profitably for the public good.” Even looking at the West and only at the West—which is of course what we do in Eastern Europe ceaselessly—nobody seemed to notice that there exist plenty of forms of well functioning social property there. It is just a matter of proper institutions. The whole situation was so absurd that, in the case of Hungary, at some point the government sold the state-owned Hungarian telecommunications network to Deutsche Telekom, another state-owned company, through the privatization process. A state owned asset was “privatized” to another state owned company (it’s just that the latter was from western Europe of course). No questions were ever raised about that. It is at such points in the process that neoliberal technocratic talk became really crucial force of social change. By the time all this happened, it was basically impossible to ask those questions. There are plenty of other such examples. So there was a property vacuum: property as such “sucked in” owners. Entire economies were sold at a rather steep discount. There are hundreds of aspects from which these privatization contracts are fascinating. Certain collective assets in Hungary, for example, were sold in such a way that the government, according to the privatization contract, guaranteed the rate of profit to the private company that buys the asset. It is very clear that eastern Europe was being reconnected to western Europe through these micro-fibers of investment, at a mind-boggling pace. In Hungary, for instance, within five or six years pretty much the entire economy was gone. At the same time, if you look at the outlays of the investor economies, their investments in eastern Europe did not really amount to much. Now that is the textbook definition of dependence: Economic dependency is a structural situation in which two parties are linked to each other such that the relationship is vastly more significant for one party than for the other. In some ways all the talk about “transition” is just another illustration of what people in Latin America were describing as dependency in the 1960s. 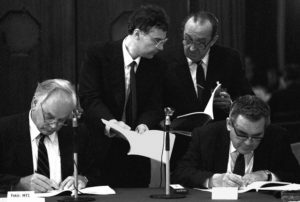 How did the EU accession process connect to that situation? I don’t know if anybody remembers, but at that time—in the eighties and nineties—the EU was an immense magnet in our part of the world. It had an ideological power in eastern Europe that was impossible to question. In Hungary, Prime Minister Horn Gyula decided to put NATO accession to a referendum. During that referendum, there was no significant anti-NATO voice in the media. I remember the visual image of some posters (produced by the “Young Socialists,” by the way), of the pro-NATO campaigns that used the symbol of the EU to persuade people to vote yes on NATO. That is, even the much less popular NATO-membership could be carried by the irresistible ideological power of the EU. There was basically no discussion about any alternative to the EU. There was the Visegrád idea, but after a few months after its establishment it became clear that none of its four members was going to stand up for each other. With privatization, the EU came to own east European assets. That was a given already in the mid-nineties. Then came accession, a very complicated and technocratic process, but at its base it was the idea that an intricate gamut of regulations had to be adopted by each new member state, and those regulations came from Brussels. That’s the definition of accession. That is interesting because the whole point of the EU has of course been the creation of a single market, i.e., removing obstacles to the internal market. Those regulations were adopted without even a hint of discussion about what consequences would follow for these countries. Then, while the societies of eastern Europe had the status of “applicant to EU membership,” there was a situation in which the economies of post-socialist societies were basically already owned, or being purchased, by west European investors, and their legal system was shaped to conform to the requirements of the European Union. Meanwhile, they, as applicants, were not members yet, ergo could not benefit from the supposed advantages of membership. That is a wildly asymmetrical relationship. Many aspects of such asymmetries continued after accession, e.g., the seven-year exception from the free movement of labor after the accession for most of these countries. Basically, accession was a quasi-“teaching” process. Beyond the transposing of the regulations and the training of EU-technocrats, the idea was that new members should basically shut up. In Hungary this went down remarkably well. 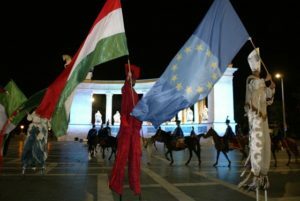 It is a mystery what made it possible for Hungarians to live with that arrangement for so long. Sometimes it occurs to me that it may have been some kind of a psychological process having to do with the “middleman” role Hungarian identity played within the Habsburg Monarchy—that is, Magyars were thought to be inferior to one supreme power but, in turn, they could imagine themselves superior to other ethnicities within the Monarchy. Or, it’s just the much discussed, tragic lack of willingness to articulate collective interests through political movements. Or, just the amazing power of the “EU”-trope in public discourse. So after the transition and accession, Eastern Europe found itself in a position of dependence on the EU, among wider processes that weaken the global position of the EU. What do you think of our own position now? I have done some work on the geopolitical dimension: the relative economic weight of these societies, i.e., the proportion of the world economy that they can claim as their own. What is really fascinating to me is that while per capita GDPs have fallen and then began to climb back, ever so slowly, in the case of these societies, when it comes to their relative weight in the world economy, all of them have kept sliding down, with no rebound. Obviously, if there are other actors growing faster than you are, even if you stay put, you are losing out in terms of relative weight. If those actors are very large, then the decline is ever more palpable. You have to remember that the EU as a whole has been sliding, pretty much throughout its entire history, and there is no reason why this process would stop, unless China and India both stop growing at the same time. Coming back to our region, our societies have experienced a catastrophic decline in their relative weight, i.e., in terms of their relative geopolitical significance in the world. Simply, the geopolitical power of these countries is significantly less than it used to be. This by itself reduces the ability of their states to utilize state capacity for whatever purpose they wish. One process that led here was that some of our region’s societies had effectively shot themselves in the leg by dividing themselves, thus automatically reducing their share in the world economy to negligible. The second process is the economic collapse of post-socialist economies. The third of course is the destruction of well oiled, state-socialist-era markets and industries, and the replacement of the latter with manufacturing that is essentially assembly plant production, with a calamitously high import content and low value added. Considering that we are a dependent part of the EU now, and that the position of the EU is changing to the worse, what is, in your opinion, a relevant position to be occupied by a leftist movement in the post-socialist region today? One thing is that it is not possible to be only “national” and consistently “left.” In my view, the left is different from other political orientations by virtue of insisting on thinking globally. That is, you have to look for allies and look for ideas that might be far away from you. The other thing that follows from this is that it is important constantly to work on ourselves, and ask the question what part of the world and what societies I identify with. The flipside of that is that we need to also critically examine the terms under which we relate to the society we are part of. For instance, where I work, at Rutgers University, the understanding is that, if you are on the left, it is natural to be in solidarity with people outside of the West, as much as those within the West who are systematically discriminated against, oppressed and excluded. When I was a graduate student at John Hopkins University, our student organization would demand that the university divest from South Africa. Not because we were from South Africa, but because we thought that apartheid really had to go, and one thing we could do to help that happen was to see if the university we belonged to had investments there – and it had, of course. So, while were most definitely not form South Africa, it totally made sense to organize protests about South Africa—locally, on the university campus. So I would say that I know when somebody is on the left when they live and act in solidarity on a global scale, and feel comfortable with that. That would mean for us, east Europeans, among other things, that we should rethink our relationship with the EU. That we are part of it, is a given, for better or worse. But what do we do with that fact? I would really try to build a movement that tries to restructure the EU, to change it from being this major pump that is sucking value out of the rest of the world into something that actually contributes to the general improvement of the human condition. By advocating extreme increases in the EU’s global education and health subsidy budget. By demanding that the EU stop supporting wars. By trying to find points of contact outside of ‘Europe’ and build networks that are based on equality, solidarity and creative forms of progressive engagement. Maybe the next time you think about going abroad, say, for a conference, you might want to consider India, or Ghana, or Egypt. Who knows, maybe you’d learn something that is useful, not to mention super fascinating. It will also help us calibrate our sense of our position in the world, our suffering as well as our privileges. It is a historical fact that leftist movements were usually built by young intellectuals. But that did not stop them from forming alliances with those who were structurally oppressed. It is just that today we live in a world where it has become pretty much insane to think that it is enough to build these alliances exclusively within national borders. I think an intelligent, creative, progressive leftist movement is one that sees itself, and acts, globally. And you might actually find that you get some actual help, inspiration, allies or ideas from others. Finally, a global sense of being on the left also raises question whether you can claim to be on the left and want to be a prime minister of a capitalist country.